Today arrived in court not sure what to expect. The Judge had changed the time from 10 am to 9:30 am so we were there at 9:15 am to find the hall filled with supporters from around the state. Also LA Times, New York Times and Associated Press were there with pens in hand. We entered the court room and sat on our side of the room while the Prosecutor and his hench men sat across from us. The prosecutors tend to keep their face down acting like they are reading cause they don't really want to have to look anybody in the eye. One of the prosecutors Rasha, looked at me in the eyes and gave me a friendly smile. Not sure what my response was. Anyhow the Judge called the case United States of America vs Lynch. My attorneys had filed some new motions and the Judge started off pretty mad because of the late filings. My attorneys started by asking for a new trial based on the statements made by the prosecutor during an off the record meeting where he said it was policy of thier department to only prosecute cases that violated state and federal law even before Eric Holder's recent statement and how they with held information that would have helped the jury find me innocent. Also the motion accused the Prosecutor of misconduct for with holding information. The prosecutor got pretty mad and annoyed and boilded over has he argued his position. Reuven Cohen one of my Federal Public Defenders filibustered for the new trial. At one point the Judge said that we would not be able to resolve such an issue today hinting at another continuation. The judge finally denied the motion and moved to the sentencing arguments. 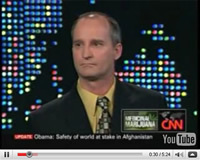 John Littrell, one of my other Federal Public Defendors, argued about the one year sentence and noted that the laws says that the one year required on one of the counts is not required if there is a stiffer sentence in other charges. Since I was facing 5 year mandatory minimums this seemed to make sence but the judge called it a 'hat trick' and denied the legal interpretation. The judge then stated that he did not see a way around the 1 year required on the sales to persons under 21. My body flushed blood and went numb knowing that now I was going to get at least 1 year. Next they started arguing about the 5 year mandatory minimums. The government continued their argument that I was the leader organizer and while my attorneys argued against it. Finally Cohen asked the judge what he planned to do and that would help him to know if he needed to continue the arguments. 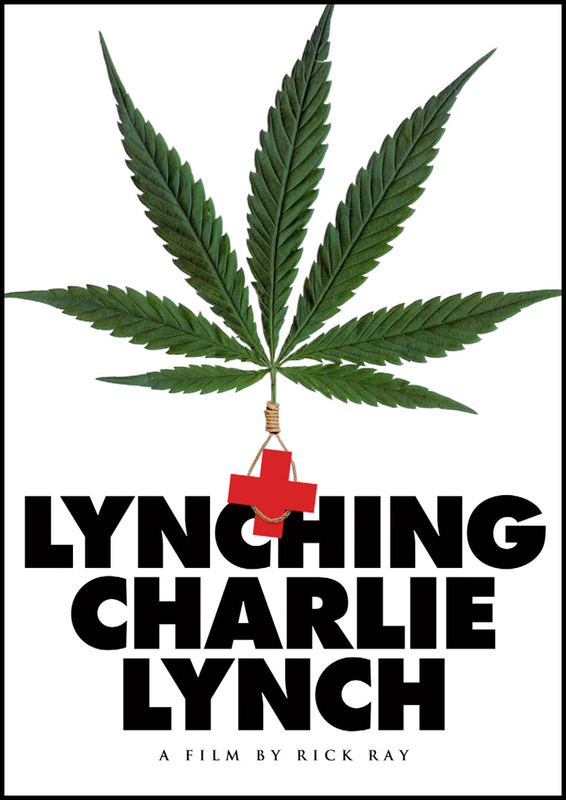 The judge finally stated that he was going to apply the safety valve to avoid the 5 year mandatory minimums based on the facts that I had 'registered with government and was not the typical drug dealer the laws were designed for. The proseuctor really got mad and the judge told him that he would write his opinion on this so that it was clear why he applied the safety valve. In a way I was releived that I was not getting a five year sentence. The judge continued, not looking up, saying that there appears to be grounds for appeal in this case that have not been brought up yet and that I was not a flight risk so he allowed me to stay out on bail pending appeal. He then ended the hearing and everybody got up to leave, when one of my other lawyers, Guy Iverson, realized that he was not done. He quickly pointed out that it was not clear what the sentence was for each of the counts. And so with half the court room still standing the judge went back on the record and continued the sentencing count by count. I essentially recieved a 1 year and 1 day sentence with four years of supervised release. The extra day allows me to get out on good behaviour if I ever actually go to jail. After the hearing I spoke with the LA Times, New York Times and Associated Press and then walked out of the court room to supporters who applauded as I walked out of the court house. There was a press conference on the steps and then we went to lunch. In regards to the prosecutor I have never seen anybody so mad that somebody was not going to spend five years in prison and then on the other hand my people were so glad that I only got one year. I just wish that it would be over so I could get on with my life. Today I had to drive to Los Angeles, about three hours one way, to report to Pre Trial Services. I was pretty tired cause I was up all night working on websites but hopped into my car and drove to LA anyway. Once I got there I ran into the Federal Building and took the elevator up to he seventh floor. I walked into the waiting area and checked in via the fingerprint computer system that asks me a series of questions and logs my reporting in. Once I have checked in I sit and wait for about ten minutes until my Officer, Kristiana Janich comes out and gets me. I walk with her to her office and she asks me a series of questions and then says 'ok that will do it'. So I run back out to my car and get back on the road as quickly as possible so I don't get stuck in traffic and head on home. Essentially I drive seven hours for a 10 minute meeting twice a month as part of my release on bail. Once I get home I call the drug testing number to see if I have to drug test the next day. Fortunately I don't have to drug test tomorrow so I take a little snooze and relax and enjoy my conditional 'freedom'. Today I drove to Santa Barbara and signed the final Bankruptcy papers. I have been working on getting estimates and documents together for months now preparing for Bankruptcy. Ever since I was arrested I have had little income other than some small website projects and donations from my website. I am used to working on major projects doing great work but for the past few years there has not been much for me to do. From Santa Barbara I drove down to the DEA office in Camarillo and picked up my laptop. Agent Burkdoll the lead agent on my case is cold and cruel. When she walked out the door Rick Ray was standing there with a camera and she asked who he was and told him to get out. Then she had me sign some paperwork and gave me back my latoptop computer which was taken from me on March 29, 2007, over two years ago. Rick Ray who is working on a documentary on my story was there at the Bankruptcy signing and to get footage of me picking up my laptop at the DEA office. We then went to his house and had dinner with some of his friends and family and then we played some music. Rick plays a pretty mean piano and I strummed along on the guitar. It was a fun time and then I drove home and got home around 12:30am. Part of my release on bail of $400,000 requires that I am under 'Intense Supervision'. This means that the Feds can arrive at my house at any minute unannounced and search my home and body. Also as part of this release I am subject to random drug testing. Everyday after 6:30 pm I have to call the local Mental Health Service and if they say 'Purple 3' then I have to drive 30 minutes one way to show up for drug testing the next day between 8 and 9 am. I had to show up this morning and so I did. Also I had to show up this past Sunday morning and so I did. Not only am I subject to all this harrasment but I also have to call and report in to my Federal Officer twice a week and drive to Los Angeles twice a month to report in. I guess this is better than being under House Arrest where I had an ankle bracelet and couldn't leave the house without permission. Or House Detention where I was bound by a 6 am and 10 pm curfew. I was under House Arrest for about 6 months and then House Detention for 3 months. I have been under 'Intense Supervision' for 12 months now. All in all I have had the Feds breathing down my neck for 1 year and 9 months. It's been over two years since they raided my dispensary and home. Pictured to the left is the Ankle Monitoring System that I had to wear for 9 months and ten days. 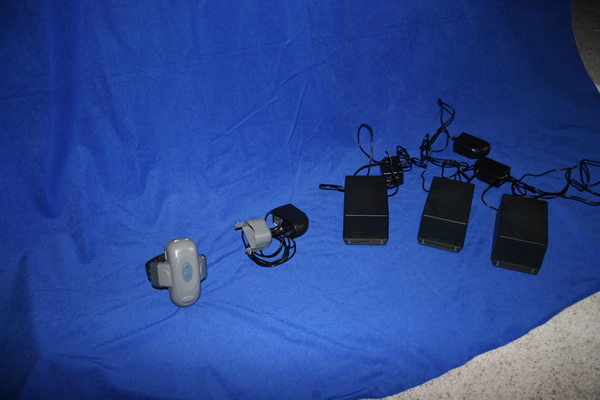 From left to right the ankle monitor, the charger, and the black boxes they installed around my house. Also tonight at 10:30 pm am going to be a guest on the 'World Famous Phil Hendrie Show'. 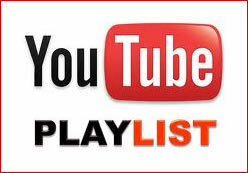 You can listen from the website http://www.mynorthwest.com . 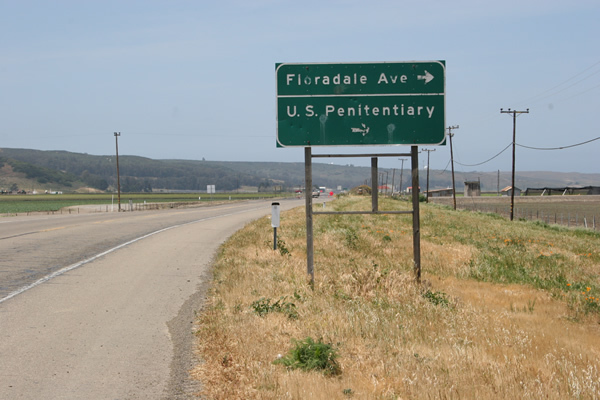 Today on my way home from Los Angeles I decided to stop by the Lompoc Federal Prison since I had never been there before. I wanted to get some pictures for my website and it is the Federal prison closest to where I live. It was about a 30 minute extra drive one way off of the 101 Freeway. So I pulled into town and grabbed a bag of pretzels and asked where the Federal Prison was. They told me to drive past the Post Office and keep driving to Floradale Ave and then turn right. So I headed for the Prison, it was a little bit out of town into the agricultural area, and I saw the sign to turn right. So I turned right and headed for the Federal Penetentiary. I eventually drove up to the prison and read the text on the front of the entrance stating that anybody who entered was subject to search of thier body and automobile. I continued onward and proceeded to the Visitor parking area. I saw one security guard walking to his car so I called out to him if he worked there and he said yes. I told him I wanted to take some pictures and he told me it was not allowed. So I went ahead and parked and put my camera in my pocket and walked to the entrance to the building. The security guard buzzed the door open for me and I walked in. He asked me what I wanted and I told him that I wanted to take some pictures of the building and he told me it was not allowed. I asked him if he knew if there was a federal law that didn't allow it and what the code numbers were. He said he didn't know but assured me if I took any pictures the camera would be confiscated. So I said thanks and as I was heading out the door I noticed a picture of Obama on the wall with some text and other pictures so I went over for closer inspection. I was viewing the pictures and reading about the Director of Federal Corrections and the officer yelled over at me and told me I had to leave right now as they had a prisoner coming out. So I quickly exited the door and headed for my car. On the way to my car I noticed two Federal SUV's approaching and one pulled in front of my car as I was opening the door. The female officer asked me if I was visiting and I said I wanted to get some pictures and she told me I couldn't do it. I asked her what US Codes do not allow pictures of Federal Facilities and she could not tell me either. I assured her that I had not taken any pictures yet and that I had asked before doing so. She allowed me to leave and as I was heading out the drive way I noticed that underneath the sign about being searched if you enter, there was another sign that had a picture of a camera with the circled slash through it indicating no cameras. So I didn't want to push my luck and got the F### out of there. On the way back I pulled over to the side of the road and got the photo of the freeway sign above. I was just glad to be heading home today and enjoyed my bag of pretzels, a coke and some radio music as I headed home for Arroyo Grande.